Fatal Sunday: George Washington, The Monmouth Campaign, and the Politics of Battle, by Mark Lender and Dr. Garry Stone. Excellent study with many superb maps. 600 pages. Published Spring 2016. $34.95. The Battle of Monmouth: The Archaeology of Molly Pitcher, the Royal Highlanders,and Colonel Cilley's Light Infantry, by Daniel M. Sivilich and Dr. Garry Wheeler Stone. New edition, 2013. 24 page booklet. $5.00. The Battle of Monmouth, by William S. Stryker. Reprint of the classic 1927 edition sponsored by the Friends of Monmouth Battlefield. Includes 4 new maps. Hard bound, 303 pages, full index. $25.00. Temporarily out of print. New edition in preparation. A Molly Pitcher Sourcebook, by David G. Martin. Contains the text of over 100 sources by more than 80 authors concerning the most famous female warrior of the Revolution. Each source is summarized and analyzed with commentary. This is the only scholarly book ever written on Molly Pitcher. Hard bound, 329 pages, footnotes, bibliography, index. $25.00. Published June 2003.Free author’s autograph on request. The Battle of Monmouth Court-House, by Benson J. Lossing. Reset text of 1878 article from Harpers New Monthly Magazine. Includes numerous original sketches, plus additional maps. 26 pages. Published 2013. $8.00. 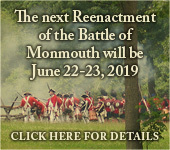 Monmouth: Battle For the North. 60 minute DVD video covering all the action of the battle, by LionHeart Film Works. Official commemorative film of the 230th anniversary of the battle, 2008. $19.00. Battle of Monmouth, by Samuel Craig Cowart. An historic account of the Battle of Monmouth, with illustrations. Booklet includes the original poem “Patriot Sires of Monmouth,” written to honor the members of the Washington Pilgrimage in 1914. A 32 page booklet published in 1998. $8.00. The Story of Molly Pitcher, by David G. Martin. An 8 page booklet written for middle school students and up. Includes study questions, 3 illustrations, 1 map. Revised edition, 2001. $2.00. The Philadelphia Campaign, by David G. Martin. Covers the British capture of Philadelphia in 1777, Valley Forge, and the Monmouth campaign. 256 page paperback. $18.95. Free author’s autograph on request. The Battle of Monmouth, by Samuel S. Smith. Reprint of booklet published by the New Jersey Historical Commission in 1975. 2 illustrations, 1 map. Published 1998. $5.00. Monmouth Courthouse 1778: The Last Great Battle in the North, by Brendan Morrissey. Osprey military book. Has excellent color maps and battle pictures. 96 pages. Published 2004 $18.95. General James Longstreet and his New Jersey Relations, by David Martin. A brief history of the families and common ancestry of Jonathan Longstreet of Holmdel, NJ, and Confederate General James Longstreet. A 32 page booklet with 8 illustrations. Revised edition. $8.00. Clara Barton and Hightstown, by David Martin, Grace Norton Rogers, and Maurice Shuman. Tells of Clara Barton’s teaching career in East Windsor, NJ, in 1851-1852, and her lifelong friendship with Mary Norton. A 32 page booklet with 5 illustrations. Published 1994. $7.00. Camp Vredenburg in the Civil War, by David Martin. Original booklet on the history and location of the Civil War training camp located within the bounds of Monmouth battlefield State Park in 1862-1864. 28 pages. Published 1993. $7.00. For shipping please add $2.00 for orders under $20.00, $4.00 for orders over $20.00. Libraries can be billed. 20% library discount.